In her "Emily Rocks" presentation on Aug 3rd, Martha Nell Smith showed the new daguerreotype of a woman who may well be Emily Dickinson. Since then, three important articles about the image have appeared. 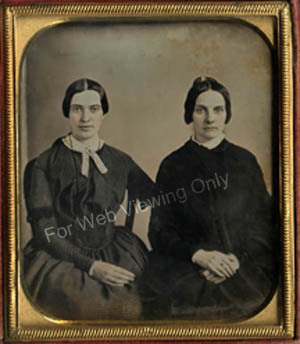 Check out Amherst College Special Collections-- https://www.amherst.edu/library/archives/holdings/edickinson/new_daguerreotype. Also check out the Emily Dickinson Museum-- http://www.emilydickinsonmuseum.org/new_daguerreotype, and the Dickinson Electronic Archives-- http://www.emilydickinson.org/1859daguerreotype.html. As the collector who found the daguerreotype has stated, Amherst College Special Collections--Margaret Dakin and Mike Kelly--deserve special recognition here. Without them, Smith's research on this image would not have gone so far, nor would we be having a conversation about it on our Facebook page. Another important early investigator is Polly Longsworth. Jane Wald of the Emily Dickinson Museum continues to provide invaluable assistance in researching this image. EDIS members might be interested to know that the Dickinson Electronic Archives will open a more extensive exhibition about the image by the end of August. In that, we want to make our exchanges about this image truly collaborative, acknowledging the work of our Amherst friends who have worked so hard with the collector when he brought the image to them in 2007. Smith delved into her own research on this image in 2009, and all of these avenues intersect and complement one another. Parallactic analyses will prove crucial here--working together, we stand a good chance of building important knowledge about this collector's find. We'll broadcast it when the Dickinson Electronic Archives exhibition space is up and available for commentary. And remember the three great resources already available, each of which will undoubtedly expand.